The rain was plentiful this morning and it has washed away much of the snow on our lawn. There are still some areas that haven't seen sunlight since mid-December but it's good to see some green again. I've done daily workouts since last Friday but haven't felt like I've done much to build the stamina I'll need for my upcoming half marathon. I took some inspiration from my wife, who runs 45 to 60 minutes daily, and spent 45 minutes on the elliptical machine while she did her treadmill workout. I used mid level resistance for the first 30 minutes and then stepped up the difficulty for the final 15. Even with that extra challenge, today's workout still felt easier than my prior two runs. I'm hoping to decide soon which race to run. There's also the Queen's Half Marathon which is a possibility but July may be too hot for me for a race of that distance. There's also the Great South Bay Half in Islip but the course looks too circuitous for my taste. I'm hoping my friend Brian will join me on my first half marathon. Perhaps he has a preference that will help my decision. Let's do it! It will be fun! 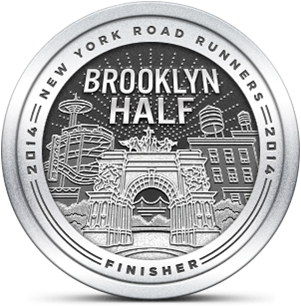 I'd be interested in reading comments from other readers about the Half Marathon races you mentioned. 1. Suffolk County I never ran it however, I've read it is boring with little crowd support. 2. 13.1 Never ran but seems interesting. 3. Ran 2x's. Great atmosphere w/easy entrance & parking and the best goodie bag. 4. Brooklyn Interesting. However as a LI boy, I hate getting up super early just to get to the race. 5. Hamptons. Too pricey. There is a LI quote that goes something like...." You know your from Long Island when you say 'Hamptons'? No big deal." 6. Great South Bay (Formerly known as The Entenmann's Cookie Run). My last race of the season & it is here that I count how many familiar faces I've seen from this past year of races. The LI RXR half is looking like the front runner then. I know you didn't have the best experience last year -- hopefully this one will be a lot better.